Based in her beloved Tasmania and working as a solo artist, this woman has charmed audiences around the world with her incredible live shows. A mixture of folk, punk, roots (and everything in between!) and overlaid with "one of the finest female voices imaginable" (Rock'n'Reel Magazine, UK), this is an artist not to be missed. Throughout her long career, Debra has graced many concert stages and festivals across Australia, including Pt Fairy Folk Festival, Moomba, Cygnet Folk Festival and Tasmania's jewel, 10 Days on the Island. In recent years as a solo performer she has also supported other outstanding artists such as The Stiff Gins, Neil Murray, Sophie B Hawkins, Mick Thomas, Dave Steel and the inimitable Dave Graney. 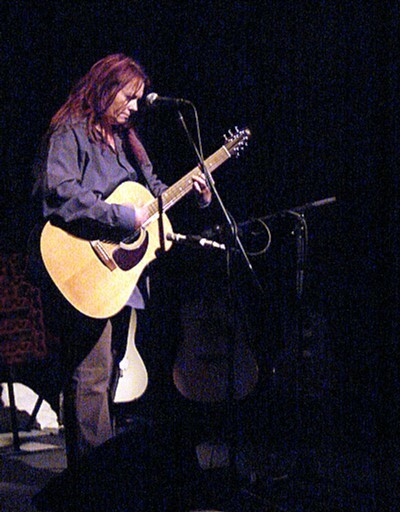 One of the founding members of Australian 80s indie darlings Wild Pumpkins at Midnight, Debra's trademark, soaring vocals contributed to the Pumpkins' 1990 ARIA award for "This Machine is Made of People". Debra is also highly regarded as an arts administrator and educator. She regularly conducts specialist workshops for adults and children in voice, songwriting and music business competencies. In recent times Debra has conducted workshops and performances on King Island in western Bass Strait, been celebrated as a "Tasmanian Living Writer" and produced "Live Sampler"
Released in 2006 this received excellent reviews internationally and has now sold out. Debra has recently completed recording a full studio album "The Woman On The Edge Of The World" which is scheduled for release in mid 2009. She tours regularly to Melbourne & Adelaide and will be performing in the UK & US in mid 2010.